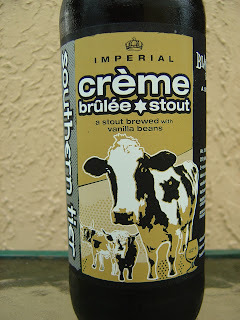 Today I'm drinking the famous Crème Brûlée Imperial Stout brewed by Southern Tier Brewing Company in Lakewood, New York. You talk about a reputation! 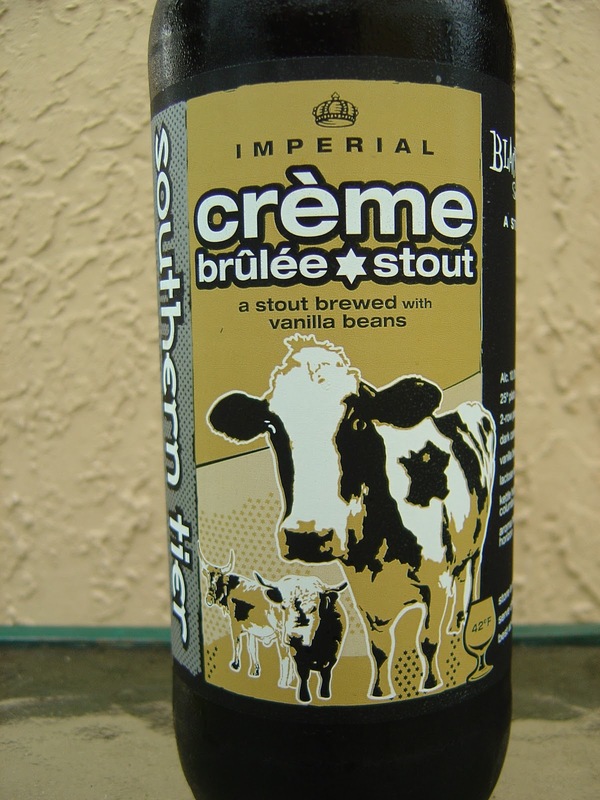 I'm not sure if there is an order, but this will be the fourth in their Imperial Stout series for me after Choklat, Jahva, and Mokah. I've even been critical that these beers are basically clones of each other except for one ingredient, then repackaged as unique. And I'm not saying I didn't enjoy each and every one of them either--just stating an opinion. So let's see with this one. The label depicts cattle in a field. 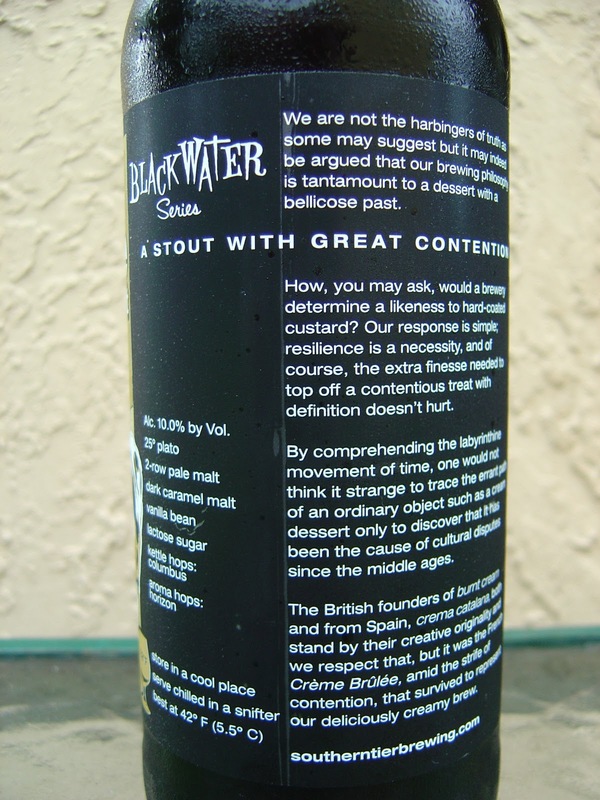 This is part of Southern Tier's Black Water Series of beers. In caps is the statement "A STOUT WITH GREAT CONTENTION" which I believe refers to the competing desserts that were potentially going to be a model for this beer. If you need me to tell you, Crème Brûlée was the winner. Read the story to see the others. Serve chilled in a snifter at 42 degrees F. Well, it's cold, but I passed on the snifter. I save that glass specifically for celebrating my Pulitzer wins. Wow! One of the nicest aromas that I have ever had the pleasure of smelling. Let's just hope that it works for beer. Bold butterscotch, beautiful baking, buttered soft pretzel. Heavenly. The flavors follow right on cue. Sweet butterscotch is the initial dominant flavor, but hazelnut liqueur with light coffee and vanilla are right there, too. This is ice cream topping luscious! 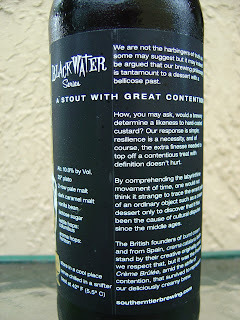 The 10.0% alcohol, however, is right behind those sweet flavors keeping them from tasting syrupy and even overly sweet. Yes, make no mistake, they are pretty sweet, but the alcohol does thin that out just the right amount. Before drinking, I thought this might be sickly sweet, but I was wrong (go figure) and not annoyed as I had been prepared to be. I never met a beer that was so perfectly named. Very creamy, rich and thick coating the mouth, nice carbonation. This is definitely a dessert-in-a-bottle type beer, and while I highly recommend that you seek this beer out, I also beg you to share it with a friend or lonely neighbor. Big 22 is a little more than I really wanted in one sitting. One other observation: Crème Brûlée is the most different of the four I mentioned earlier. Ready. Set. Go (call your local Total Wine store to see if they still have any)! I concur. This beer is in my top 10 ever. I'm actually rubbing myself thinking about having some. I saw this the other day...was on the fence about buying it that day. Now I'll pick it up for sure and give it a try and a review. Thanks! BE SURE to share it with someone you like. It is sweet, but oh so delicious! My gf will love it I am sure. Did you acquire this bottle recently? I've never been able to find one! I had this on tap at Coffee District and it was DIVINE. People standing within several feet of me could actually smell it. I need to have more of this. Now. No, I've had it for a while, since they first hit the shelves. Just finally got around to drinking it. I meant to look at my Total Wine yesterday to see if they had any more but I forgot. I've never had this! Where can I get this creme brulee is one of my favorite desserts and I MUST try! Up in Broward, Total Wine has the best selection and price. I don't know if there are any of these left on the shelf this year but they'll be back again next year. If you live near a TW or Crown Liquors, call them and ask. Can I make a request for a post? 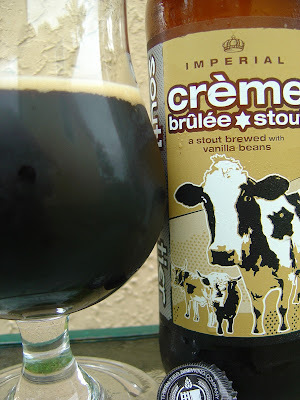 For those of us who are not at all familiar with beers, could you write a post with the definition of say Stout, or IPA or whatever, you know what I mean?